Most people in India still refer a 15.6-inch form factor as THE definition of a laptop. The screen size and the form factor attached to it echoes within people’s preconceived notion about the dimensions of a Windows laptop. About two years back, Dell took a stab at changing that and came with Dell XPS 15, which featured the same infinity display as its 13-inch cousin. This brought the standard 15.6-inch display into a 14-inch chassis at the cost of the numpad. I recently reviewed the Dell XPS 15 and while it is a good machine, the price makes it a bit more exclusive. Seeking the same design philosophy, Asus launched the Vivobook S15 in India earlier last year and I finally had the chance to review the machine. Prices start around Rs. 60,000 for the base model and go up from there. I have been using the top of the line variant of this laptop for quite some time now and while I do get what the company is trying to achieve, I think it is still a work in progress. Here’s why. Right off the bat, it is evident that going from a 15-inch form factor to a 14-inch form factor, Vivobook has lost some weight. Weighing under 2 kilograms (1.7 kilograms), this 15.6-inch everyday laptop is now lighter than most of its competition. Some of that weight reduction is due to the smaller footprint, but it is also due to the lighter chassis. The display lid is made out of a relatively thick sheet of aluminum and the base of the machine is all plastic. While this makes it lighter but is susceptible to noticeable flex. While the display has some flex, it is not as concerning as the flex I observed on the keyboard deck, which does hamper the typing experience. Design-wise, Asus has kept things plain and simple, quite literally. 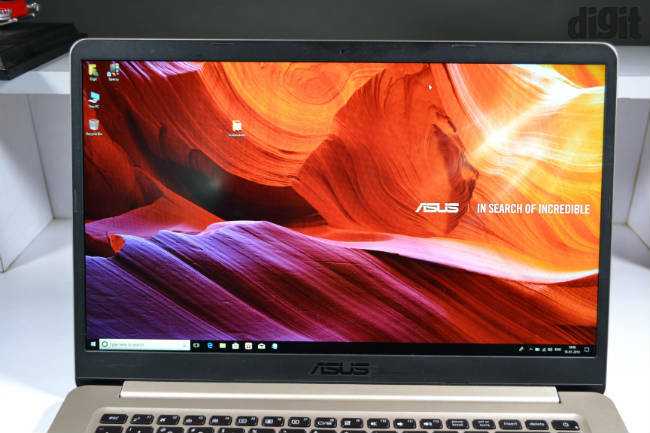 Gone is the signature Asus concentric circle design seen on earlier machines and in its place it has a brushed metal look. Whether you like Asus’ new understated take on design is completely up to you, but I think the laptop looks just fine. The base of the machine is secured in by 10 Philips head screws, two of which are under the rear rubber feet. Needless to say, you will void your two-year warranty on the machine in doing so. Anyway, taking off the back cover gives you access to the dual RAM slots, HDD drive, and the M.2 SSD storage. 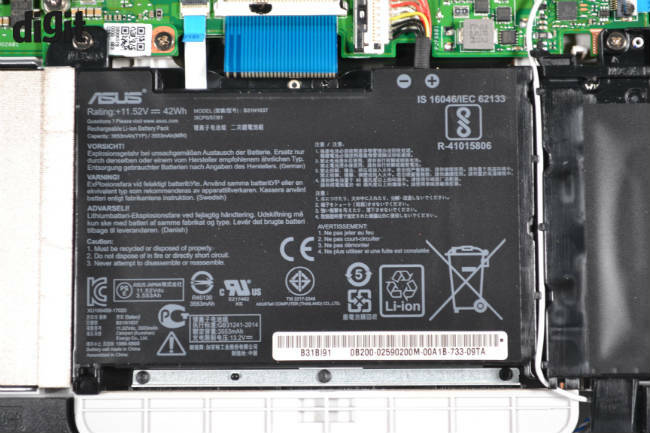 The battery and WiFi module also seem user replaceable if required, as they are fastened with screws and seem to be connected with removable cables. Opening the rear hatch also gives us a better look of the single flat copper pipe, which is responsible in taking the heat away from the 8th gen Intel processors as well as the MX150 GPU from NVIDIA. The single blower style fan then exhausts all the hot air out of the rear. The 15.6-inch display offers a 1080p resolution, which is an IPS panel and offers good viewing angles. 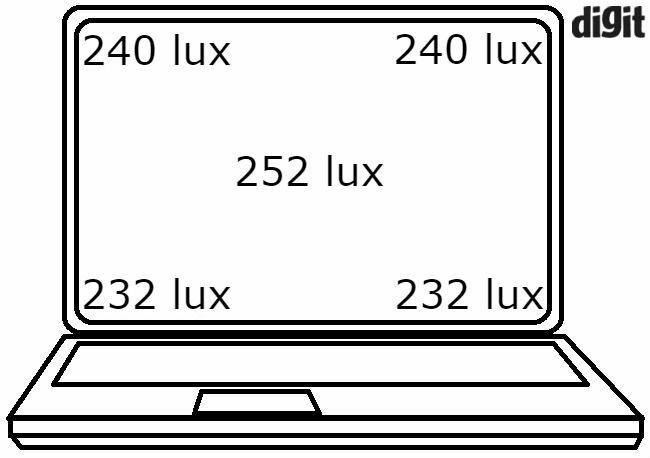 The brightness is just about average with the max luminance going up to 252 lux at the centre of the display. I also like the fact that the brightness levels are pretty consistent at either end of the display which makes viewing video content on the machine a pleasant experience. That said, the colour fidelity of the display is not the best and it is certainly not suited for users requiring color accuracy when working with image or video editing software. 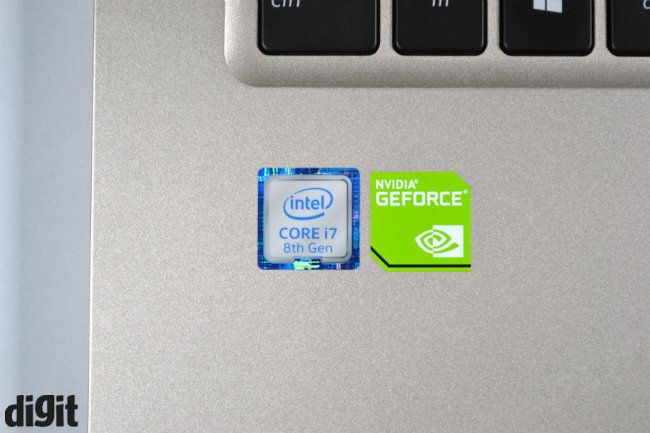 As for the I/O selection, the laptop offers almost everything you may need from a machine of this caliber. You get two USB 2.0 Type-A ports along with a microSD card slot (USB 2.0) on the left-hand side. 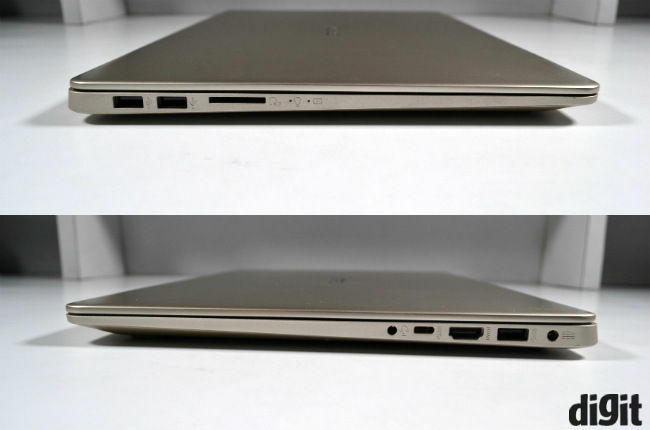 On the right-hand side, you have the microphone/headphone jack combo, one USB 3.0 Type-C port, HDMI out, another USB 3.0 Type-A port and a power port for a barrel style pin. 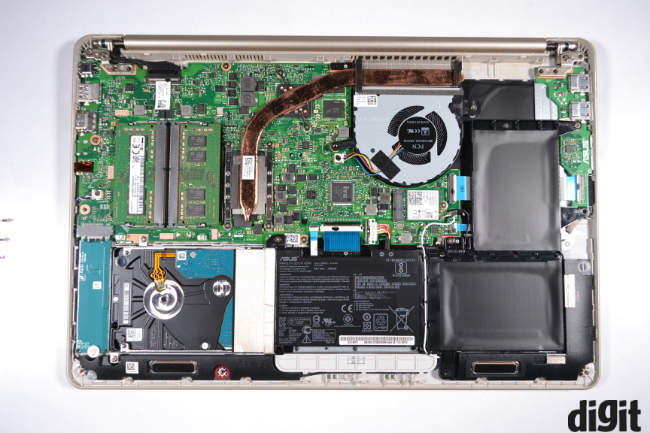 Going by the internal design layout, it is quite evident that there was no space for a DVD drive, but Asus could have included a standard ethernet port or should have added a USB adapter for it. It is disappointing to have dated USB 2.0 ports though, while almost everyone has moved or is actively moving to USB 3.0 only ports. Coming down to a smaller footprint, this day-to-day laptop misses out on the numpad. While I don’t feel that is a big sacrifice, some may disagree. However, Asus has added an extra row of keys on the right of the keyboard moving the home, end, pg up and pg dn keys there. The slightly altered layout does take some time getting used to, but it does come in handy once you get to use it more. I also feel, the two left and right arrow keys could have been full-sized ones, but then again, it all comes down to preference. That said, the keyboard provides an average typing experience. This is due to lack of consistent feedback between different keys. The keys require a harder throw and offer a springy feedback than the category average. The keyboard isn’t ideal for a long typing session. Besides that, the keyboard covers all the important toggles and offers a two-stage white backlighting. 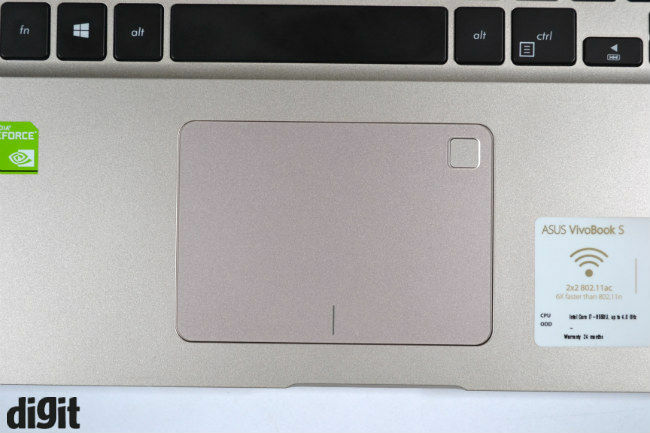 As for the touchpad, it is a standard plastic elan touchpad which is running on Microsoft Precision drivers. The plastic surface is not as smooth as glass touchpad or even some matte plastic touchpad I have seen in recent times. 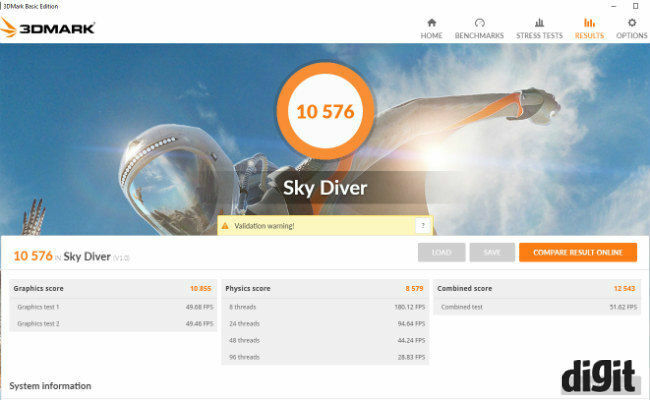 This means that the swipes are not as precise and all Windows-based gestures will require some practice. 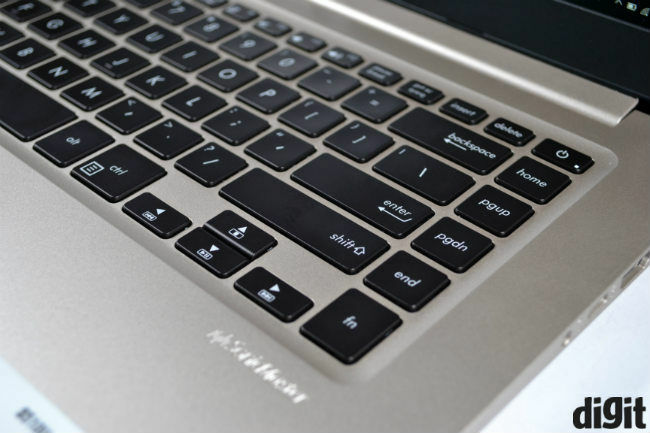 Hence, just like the keyboard, the touchpad on the Vivobook S15 takes some getting used to. The two left and right click buttons work well and have a short click and offer an audible feedback. The touchpad also includes a fingerprint scanner at its right-hand corner which uses Windows Hello and works as intended. It is easy to setup and quite reliable, although it did miss the fingerprint 1/10 times, forcing us to login via the pin. While the Asus Vivobook S15 has its set of issues in the build department, the laptop packs one of the best specification sheets I have seen on a mainstream laptop lately. Our test unit was powered by an Intel Core i7-8550U processor. This is an all-new 4-cores 8-thread processor, which replaces the previous Core i7 lineup. It is quite powerful and can handle all day-to-day tasks with ease. The CPU can even handle light gaming without any issue and hence, is accompanied by an NVIDIA MX150 GPU. 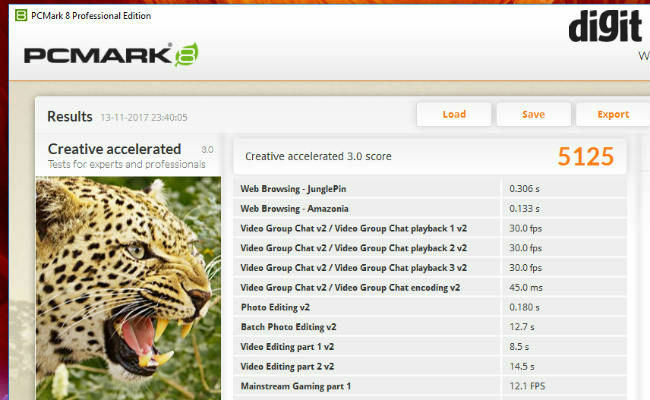 The MX150 is not as powerful as the GTX 1050 but does not disappoint if you are into light gaming. The laptop managed to provide more than 60fps in games like Dota 2 at full settings and easily averaged around 82 fps in older titles such as Bioshock Infinite. 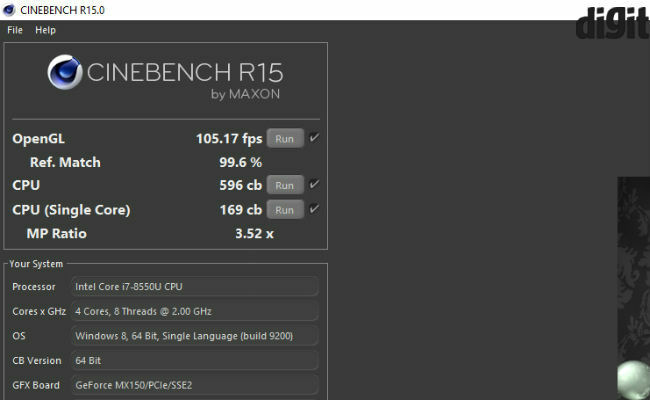 Our test unit featured 16GB DDR4 RAM, which is more than enough even when you are heavy Google Chrome user. The 128GB M.2 SSD by Toshiba is a welcome sight in Asus’ mainstream laptops, but it is neither fast or exclusive to Asus. That said, I do appreciate the addition and I hope going forward, more mainstream laptops will follow suit. Although, a Samsung SSD would have been a faster option. When it comes to heat management, the single heat pipe, and fan combo is not very reassuring. While the machine stays comfortable on low to medium loads, once you push it beyond that with some video editing or try to play a game, the temperature on the base of the machine rises to near 50-degree Celsius. While the heat is mainly concentrated on the top portion and the base of the unit, one can feel the heat between keys on top rows. 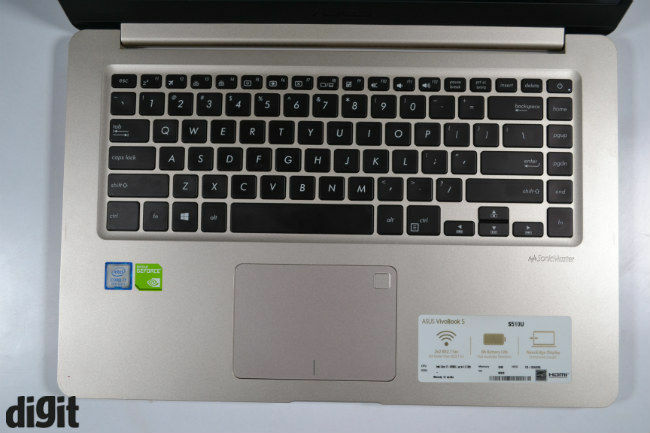 The slimmer profile surely impacts the ability of the Asus laptop to stay cool under load and that can be a concern if you plan to use the laptop frequently on your lap, The two user-facing bottom firing speakers are not extremely loud but do maintain audio clarity up to 75% volume. Beyond that, you will hear distortion in some mid and bass heavy tracks. The laptop falters once again when the battery is taken into account. Scoring just 167 minutes in the PCMark Battery test, the Asus Vivobook S15 has one of the lowest battery scores I have seen on any laptop of any kind. Using the laptop as a daily driver, we couldn't get more than 4-5 hours of usage out of the machine, even with light to medium use and brightness at 75%. In comparison to the 6-7 hours of category average among mainstream laptops, this is quite low. The worst part is that that the laptop carries just a 42Whr battery which does not provide enough juice to run the machine at full chatter without power. We guess Asus went in with lower weight and slimmer profile as the key features of the Vivobook S15, and that clearly impacts battery life and thermal management. Overall, the Asus Vivobook S15 510UN feels like a half-baked product by Asus in the highly contested mainstream laptop space. It looks pretty, has a decent display and offers good performance, but beyond that, the laptop falters. The machine does not provide a satisfying typing experience, nor does it offer good battery life, which is one of the primary functions that a mainstream laptop should fulfill. That said, it is still hard to beat the Vivobook in sheer specifications and that's where you have to make a decision. You can either learn to live with the sub-par keyboard and battery life or just get an entry-level gaming machine instead, something like the ROG GL553VD, which will provide you with better performance around the same price. 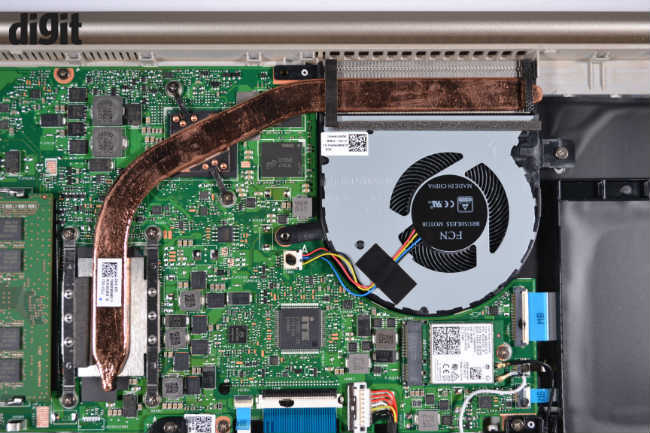 If performance is not your main priority, older models of the Dell Inspiron 7000 or the Lenovo Ideapad 520s are worth checking out.